This book is a practical guide to the very practical subject of Tax Due Diligence. It aims to show that tax due diligence is not a commodity by leading the reader through the tax due diligence process and explaining at each stage how to extract the maximum value from tax due diligence. 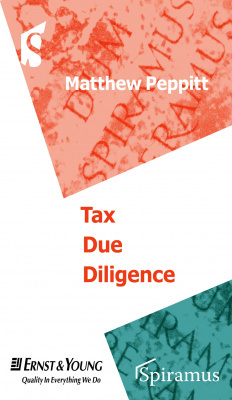 Covering a wide range of transaction scenarios, the book deals with every aspect of tax due diligence, including: 	What is tax due diligence and what it is not 	The different circumstances in which tax due diligence is required and the implications of each 	Planning tax due diligence 	Defining scope and avoiding unnecessary tax due diligence 	Managing the tax due diligence process 	Obtaining and analysing information 	How best to address issues identified by tax due diligence 	Making the most of limited information 	Tax due diligence in asset deals This book is aimed at anyone in industry or practice who is commissioning or planning a tax due diligence exercise or who is responsible for its performance.